Last updated: May 25, 2018 at 6:02pm by Savanah – Just over $4.5 billion was generated in state lottery tickets sales in the last fiscal year; an all-time record. State lawmakers continue to look at pushing a statewide voter referendum on the approval of land-based casinos; commercial and tribal casinos are currently not allowed. Unfortunately, that hasn’t happened yet but groups are putting together research data to try and figure out how positive of an economic impact these casinos could have if passed. Governor Nathan Deal was opposed to legalization of land-based casinos but he has softened his stance in recent months. Senator Brandon Beach is pushing for the passing of Senate Resolution 135 which would legalize betting on horse races, including on the internet. His Resolution was approved by a Senate Committee and is now waiting for a House and Senate vote. The Georgia Senator believes this would create 4,000-6,000 jobs in the Peach State. Georgia seems to be one of the stricter states when it comes to gambling and their laws. Although many people in the state, including lawyers, say their gambling laws are as “clear as mud”. Well, they aren’t the only state with blurry laws but at some point you would think all these states would clean them up. Actually, this definition is a little clearer than most state’s laws because it mentions, “Even though accompanied by some skill” with “some skill” being the keywords. We point this out because playing poker is often debated as a game of skill and not chance. Although, many people in the law will classify poker as the opposite. Can I Play Poker in Georgia for Real Money Legally? As you can see from the law above, the answer is no in regards to playing home games, at an established business, etc. As long as money is being wagered, exchanged, and risked, the law does not allow it. There are no poker rooms within the state or even Indian casinos for that matter where you often can play poker. When it comes to the internet, well, that is another whole can of worms. This is not a black and white area, but what we could find was poker raids on land where people were accused and sentenced for violating the Georgia Code. What we couldn’t find were instances where people were arrested and accused for playing poker on the world-wide-web. Yes, you heard it correctly. There are only two forms of gaming allowed in the State of Georgia, charitable and the state lottery. Not even pari-mutuel horse race betting is legal, although that might change in the next 1-2 years, and they have zero Indian casinos as well. Nonprofit organizations can obtain a license from the Georgia Bureau of Investigation, which will allow them to legally have raffles and/or bingo game contests to help raise money for charity. The license fee is typically $100, and all nonprofit organizations must report their net revenue as long as it exceeds $50. People under 18 years of age can participate in raffle or bingo games as long as the prize is not more than $5 in wholesale value. 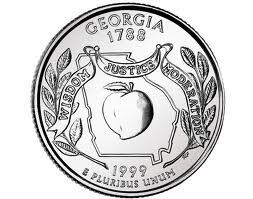 The Georgia State Lottery was established in November of 1992, and has been a huge success ever since to say the least. They opened for official business in June of 1993. and made $463 million in total sales within the first five months. What’s even more amazing is they were able to pay back its start-up line of credit within two weeks of opening! It’s not a surprise if you think about it; what other forms of gambling are they going to spend their money on? Nothing, the lottery is basically their only option. The sale of lottery tickets online was approved in July 2012 and went into affect in November 2012. The lottery is headquartered in Atlanta and operated by the Georgia Lottery Corporation, find all their contact information here. Their laws states that half the money collected goes to prizes/payouts, a third to education and the rest towards operational expenses.